Offering you a complete choice of products which include bottle cap torque sensor 100kg cms, socket wrench torque sensor, torque wrench calibrator, digital torque meter 1 to 5n.m, digital torque meter 10-20-50n.m and digital torque meter 500n.m. MONAD has unrivalled experience in providing affordable solutions for torque measurement applications. 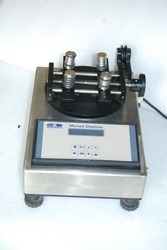 The range of products extends from simple manually operated instruments, through to sophisticated computer-controlled systems. Ideal for testing torque on bottle caps, closures, valves, fasteners, and other items in sizes ranging between 0.56 - 5.7 in [14 - 148 mm] in diameter. Models contain reversible jaws or movable posts to easily accommodate a variety of shapes and sizes. Capacities available from 10 ozin to 100 lbin. In addition to torque generally associated with screw closures (eg application and removal torque), closure development areas such as tamper-evident seals, or child resistance have increased the range of torque which need to be measured. These sensors are primarily used to measure the output torque of clutch type nut runners in production fastening operations. Units equipped with incremental encoders are available for applications where fastener’s angle of rotation as well as torque data is required. The Monad MT5H Torque Wrench Calibrator is designed to test torque wrenches up to a maximum capacity of 1500 N•m. Any torque wrench within the systems maximum capacity to measure the applied torque can be tested in the horizontal plane to their appropriate standard. 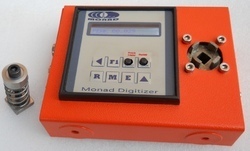 Thank you for purchasing a Monad Electronics Digital Torque Meter. We know you have a choice and all of us here at Monad are pleased that you chose our product. 2. Catch and hold the peak value in the test. 4. RS-232C output, connect with printer, which can print 10 value data and the Max value,Min value, Average value, eligible value and incompetent value. 5. High and low setpoints facilitate Go/No Go testing. 6. Calibrate power screwdrivers torque measurement and wrenches or use as production tools. 7. Download peak or continuous data for statistical process control. 8. 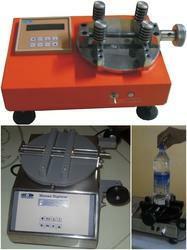 Calibration kits are available for popular models. 14. Supports non-contact frictionless sensors. 15. 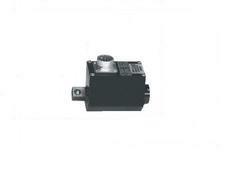 Support BLDC, PMSM, PMDC, Induction, Stepper motors. 16. Motor power switching is done automatically by the system. 17. Motors can be tested inside their applications. 18. Tests results are provided graphically and tabulated. 19. Test reports in Excel format. Monad offcers clamp-on rotary torque sensor which is ideal for measuring torque on rotating machinery or propulsion systems where little down time can be afforded. 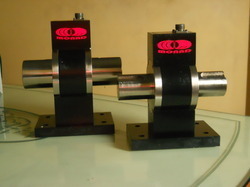 Clamp-on collars surround the shaft to be measured and provide digital readouts to display torque, RPM, and computed horsepower. A programmable alarm can be set so that the system can be shut down or scheduled for maintenance. Monad is pleased to introduce the latest addition to our torque transducer product portfolio, the new Digital Telemetry Rotary Torque Measurement System, available in many different configurations to meet the needs of your particular torque measurement application. True Torque Measurement –Monad’snon-contact digital telemetry design enables higher integrity of the data capture through higher resolution and no mechanical interferences; resulting in a more accurate indication of the actual torque being experienced. Flexible Modular Design –Monad’s modular design can easily be adapted or customized to fit into many different types of test stands to meet specific test application requirements. Simple Installation, Setup, and Operation – The Sensor is compact with quick attach wiring connectors for quick commissioning. It has easy to set up parameters via the software system and enables you to make test parameter adjustments on-the-fly. The Torque Bias Ratio (TBR) is the ratio indicating how much more torque the differencial can send to the tire with more available traction, than is used by the tire with less traction. This ratio represents the "locking effect" of the differential. 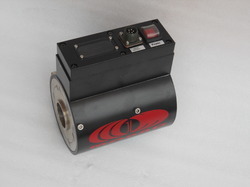 Monad’s Differential Torque sensor responds to driveshaft torque. Some include spring loading to provide some small torque so that with little or no input torque (trailing throttle/gearbox in neutral/main clutch depressed) the drive wheels are minimally coupled. Five simultaneous analogue output signals, two torque channels, two angle channels and one angular velocity channel. Bearing friction influence on the torque measurement has been eliminated, allowing high accuracy low torque measurements. Low profile design retains the same driving conditions as with standard steering wheels. Easily mounted on any road vehicle by means of flanges - no disassembly of the steering column is required. Monad non-contact Rotary Torque Sensors is suitable for laboratory applications as well as industrial environments because of their compact size and multiple mounting options. The contactless transmission of supply voltage and measuring signal enables continuous operation with low maintenance. 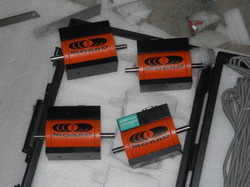 Monad’s Optical Rotary Torque Sensor/Transducer provide an ideal means for precise dynamic measurement of rotary and static torque of less than 5000 Nm at high speed and high bandwidth. The importance of torque measurement has been realized in diverse applications for performance optimization and quality control. Emerging potential applications such as medical prosthetics and robotics are expected to be major driving factors for the global torque sensor market in coming years. Torque sensors are being employed in automotive and industrial sectors sincelong time and have recently paved their path into several other fields also. Moand Sensors have gone through numerous technological advancements due to the continuous demand in the market for precise measurement and high performance. 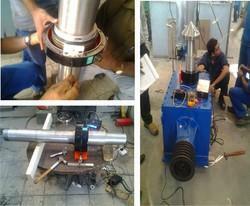 Defence, Aerospace, R&D Establishments, Offshore test rigs, Automotive, machinetools, electrical and engineering industries. Monad PTO (Power Take Off) Shaft Torque and Power Monitoring System will monitor and log the torque, shaft speed and transmitted power accurately when testing new systems driven from all standard PTO Shafts. The tractor's PTO or stub shaft, transfers power from the tractor to the PTO-driven machine or implement. Power transfer is accomplished by connecting a drive shaft from the machinery to the tractor's PTO stub shaft. 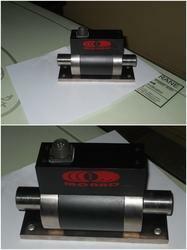 MONAD`s Sprocket/Pulley Torque Sensor is a low-cost, accurate method to measure processing torques. Coupled to any belt or chain driven stub shaft and monitored by a closed electrical circuit, machinery speeds and material feed rates can be precisely controlled. Consequently, this automation can increase productivity and decrease power consumption. Capable of accepting various pulley wheels and shaft diameters, this sensor features a highly accurate integrated sensing element, capable of resolving low torque levels while being exposed to high radial loads created by belt drive systems. Use it to replace a standard pulley system for equipment like engines, generators, fluid pumps, or other motor driven equipment and continuously monitor real time torque while in operation. This sensor can be adapted to a wide range of belt drive systems and can be installed in a dynamometer test stand or on vehicle. Various torque capacities and pulley gears can be designed to meet your specific requirements. 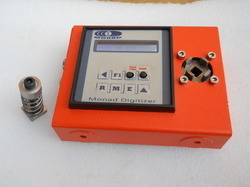 Monad’s Reaction/Static Torque Sensors is designed for measurment of Direct Torque, and is particularly suited for Reasearch, testing, Calibration, Torque feedback control andOver Torque protection.The Torque sensor is provided with integral, robust MIL grade connector for quick & easy connection. 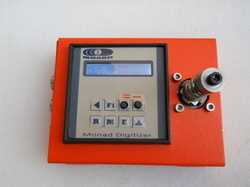 Monad has a wide range of standard models like Flange type, Key way type, Square drive,Spline type, Clamp on type and other style or ranges can be designed specifically to meet apartcular applications requirment, where measurements can be made in both clockwise and counterclockwise directions. Very compact and rugged for heavy duty applications. Compensated for axial and bending moments for good accuracy. Sensor is sealed for IP 65-IP67 degree of environmental class. Can be supplied as per customers required size and capacity. 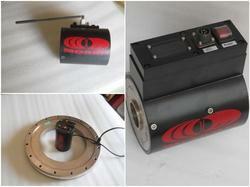 For higher speed (rpm) torque measurement applications the rotary transformer system might be used. The rotary transformer system consists of two coils, one static coil that is attached to the transducer's housing and one rotating coil that is attached to the transducer shaft. This offers the distinct advantage of there being no contact between rotor and stator and incorporates both transmission of power to and signal back from the rotating strain gauge bridge circuit. Rotary transformer type torque sensors offer typical inaccuracies of ±0.2% and are capable of speeds up to 50,000 RPM. The rotary transformer system is versatile enough for use in special torque transducers and those where space is limited. However as this design incorporates bearings, the maximum rpm is more than the slip-ring design but limited by the maximum specified performance of the bearing. The system can also be susceptible to noise and errors, which are induced by the alignment of the transformer primary-to-secondary coils. Because of the special requirements imposed by the rotary transformers, specialized signal conditioning is also required in order to produce a signal acceptable for most data acquisition systems. 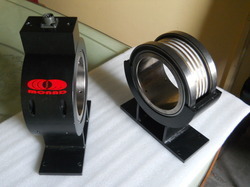 Monad Rotary Torque Sensor category has Torque Sensors which are used in slip ring and non contact rotary torque measurements. The most common utilization for these models is for inline/reaction applications, where measurements can be made in both clockwise and counterclockwise directions. The MONAD Torque Transducer with bellow couplings can be used in any mounting position (horizontal, vertical or oblique). With vertical or oblique operation, please ensure that additional masses are sufficiently supported. The Transducer Display with datalogger is available for all torque series transducers and displays values of torque, peak torque, speed and power while making a xls data record if required. 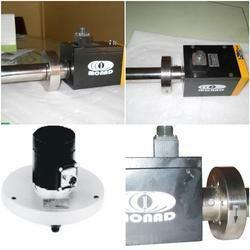 The MONAD Torque Transducer can be used in any mounting position (horizontal, vertical or oblique). With vertical or oblique operation, please ensure that additional masses are sufficiently supported. Monad offers a variety of slip ring-based torque sensors used in many types of automotive, transportation and general industrial testing, monitoring and development applications. Many of our slip ring torque sensors were originally developed as a result of special requests from our customers for a torque sensor to fit their particular applications and then standardized into our product line. 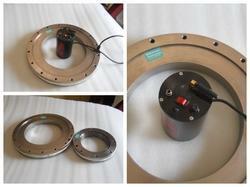 Monad’s slip ring, torque sensors are available in a number of configurations and options. However, if you don’t see exactly what you need, please don’t hesitate to contact us to discuss a customized solution. Measure the output torque of stall and clutch-type nut-runners in production fastening operations (not recommended for mechanical impact wrenches). 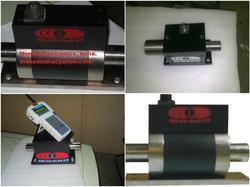 For applications where the fastener’s angle of rotation as well as torque data are required. Mechanical configurations available on our slip ring torque sensors include square drive, keyed parallel shaft, flange-to-flange and flange to square drive. This steering effort transducer was designed to evaluate steering torque requirements, new and existing steering systems and components used in automobile, trucks, buses, and material handling equipment. Quantitative evaluations of steering systems, steering geometries, tire interactions, and safety factors are made using this device. This is fastened to the existing steering wheel by means of a fixed or optional adjustable 3 point clamp assembly. 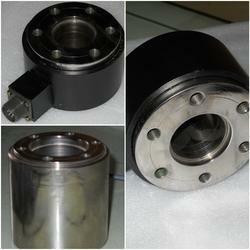 For direct steering shaft attachment, a custom adapter plate is available. Both sensor functions are integrated within one sensor. Full on-board conditioning electronics, with built-in reset, torque calibration function and a facility to send a start trigger signal to the remote data acquisition system. Live simultaneous analogue output signals. 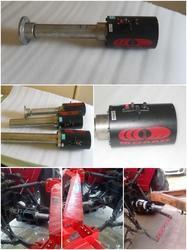 Easily mounted on any road vehicle, no disassembly of the steering column is required. Monad Wheel Torque Sensor Instrumentation Assembly is ideal for collecting data in wheel applications,accurately measuring wheel torque and speed during driving, braking and coastdown. Standard model is available for front wheel, rear wheel, and all wheel drive vehicles. Installation is made without vehicle rework. Excellent temperature compensation and a unique sensor design provide intrinsic immunity to temperature gradients and radial and cornering loads. Monad Wheel Torque Sensor are constructed of corrosion resistant materials and waterproofed to permit operation in shallow water. Superior data accuracy is achieved by using latest technology in Torque measurement, Digital telemetry. Measured Torque signal is signal conditioned, amplified and then digitized at measuring point itself and then transferred using digital wireless technology. This provides nearly no signal distortion and high accuracy. The Monad automobile wheel torque sensor is designed to be bolted to the brake drum or spindle of a car or truck in place of the regular wheel. The wheel is then bolted to the torque sensor. This moves the wheel outward approximately 1-1⁄2 inches from its original location. 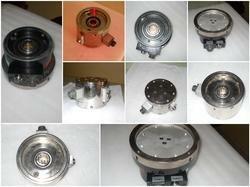 Looking for Torque Sensor ?